Greenix Polyurethane Panels create new possibilities of design without the constraints of conventional building materials. Greenix Polyurethane Panels create additional warm living space in the roof by eliminating conventional trusses. This can provide an additional 25% of floor space at no additional cost and makes use of all of the potential space in the building. Greenix Polyurethane Panels can offer a thinner wall thickness than a conventional wall, but still deliver improved insulation values, gaining greater internal space for the same size overall footprint. Unbeatable insulation value means energy costs can be reduced by up to 60% over traditional construction. Greenix Panels are better for your builder. Pre-cut and fabricated panels reduce installation time by 60%. The building process requires less skilled labor and less supervision. Specialized tools are not required and fixed pricing allows budgets to remain accurate. What are the Physical Advantages of using Greenix Panels? The insulating foam core and the OSB facings used in the manufacture of Greenix Panels do not provide any food value to vermin and are resistant to attack by mold and microbes. The solid core of foam insulation in the panels cannot slump over time and the minimal thermal bridging ensures that the building is heated evenly, free from cold spots and condensation. The building will benefit from reduced heating costs for its entire lifetime. This is an important consideration at a time of spiraling energy costs. What are the Financial Advantages of building with Panels? Greenix Panel houses are attractive to future buyers and occupants, due to the reduced utility costs and the many other benefits that a Greenix Panel building provides. To make a product with the same strength, timber uses 20% of the energy needed to make concrete. Timber is naturally low in thermal conductivity and an excellent insulator. It is 15 times better as an insulator than concrete and 1770 times better than aluminum. A 1″ timber board has better thermal resistance than a 5″ brick wall. When compared with traditional timber frame buildings, Greenix Panel construction uses approximately 50% less wood, which all adds to the positive environmental impact of this form of construction. How is the vented SIP roof created? For asphalt shingles, a cold roof works best. 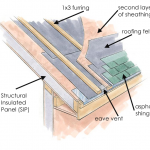 Create a cold roof by applying a layer of sheathing over 1×3 furring 16 in. on center. 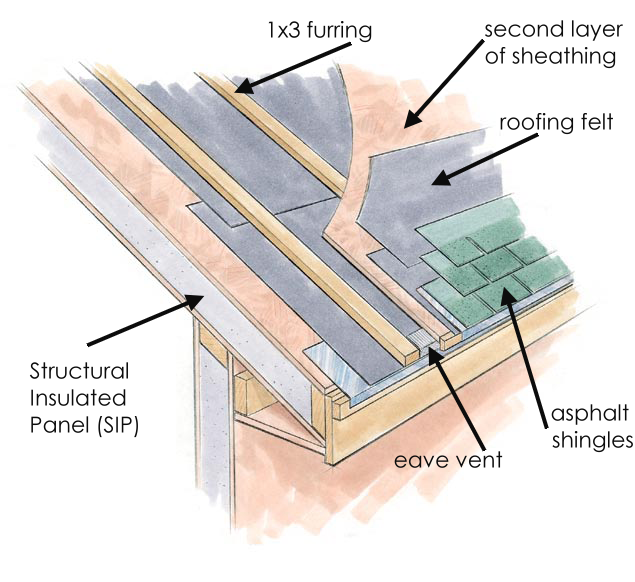 Venting at the ridge and eave allows air to move freely between the two layers of sheathing. This style of roof helps to prevent moisture buildup. How much are they? Do Greenix Panel building cost more than traditionally framed structures? When evaluating the cost of building with the Greenix Panel System, you need to look at the overall construction costs and long-term operating costs, not just the cost of the material. Using Greenix Panels result in less waste, less field labor requirements (along with the associated field labor overhead costs, such as transportation, lodging, meals, benefits, etc. ), much faster construction time (and fewer weather delays), lower HVAC equipment costs, and greater comfort. Long-term operating costs for utilities are greatly reduced. Greenix Panels are even more competitive when the design is optimized to incorporate them. Consequently, architects design dimensions at two-foot and four-foot increments, engineer roof pitches at steeper angles to increase loft square footage, and make other similar adjustments to take full advantage of Greenix Panel capabilities. Using the Greenix Panel System, therefore, usually results in lower overall building costs and better value. Is an Greenix Panel a “green building product?” Is it environmentally safe to make and use? Yes. Greenix Panel structures require considerably less framing lumber than a conventionally framed building. This saves trees. OSB is made from the 37% of a tree that is normally waste from making solid lumber. Solid lumber, as used in typical wood-frame homes, requires 63% of the wood from harvested trees. Greenix Panels are pre-cut in the factory, result in far less “job-site waste.” The small amount of wood scraps resulting from the Panel manufacturing process at the manufacturing facility is used for other products or recycled, rather than going into landfills. We use a low-pressure foaming system designed to maximize the advantages of the foam properties. The cured foam is inert and non-hazardous. The foam process used in Greenix Panels uses no “ozone depleting substances”, such as chlorofluorocarbons (CFCs), hydrochlorofluorocarbons (HCFCs), hydrobromofluorocarbons (HBFCs), halon, methyl bromide, carbon tetrachloride, or methyl chloroform. Only EPA-approved materials are used in the manufacture of Greenix Panels. Greenix Panels polyurethane foam contains no formaldehyde. We also offer foam that contains agricultural-based oils derived from soy beans, corn, sugar beets, and/or sugar cane. The foaming equipment is cleaned with hot water and a detergent, and the small amount of residue is safely disposable. Are ants and termites a problem in panels? No more than in conventional construction. In climates where either termites or ants can cause problems, panel manufacturers recommend that all homeowners use the same preventive treatments (topical sprays around foundations, termite shields, etc.) that they would use in a stick-framed home. Note, however, that the foam within the panels does not provide food value for insects. How does the Greenix Panel system perform in fires? Fire requires three components: ignition, oxygen, and fuel. Greenix Panels have no “air” within the solid core of the insulation. The fire cannot “run up the wall” cavity, as is the case with traditional stud construction. Polyurethane foam does not melt. The Greenix Panel system has passed every standard fire test that is required of wood-based or “Type V” construction. To the surprise of some building researchers, data from extensive laboratory fire testing as well as reports from actual house fires indicates that Greenix Panel made structures tend to be more resistant to house fires than standard stud structures. We test our panels to the American Society for Testing and Materials (ASTM) E84-04 “Standard Test Method for Surface Burning Characteristics of Building Materials” for smoke spread and flame spread. Greenix Panels have a Class 1 foam core. The foam components are formulated to have a flame spread of less than 25 units and smoke spread of less than 400 units. Are Door and Window openings cut later? Doors and windows are identified in the building plan. As part of the manufacturing process, door and window openings are framed and blocked out. When foam is injected into the panel, the door and window frames become an integral part of the panels. Where is the plumbing installed to a Greenix Panel building? Plumbing is not usually placed in exterior walls, but rather through the floor into the bottom of cabinets. Where exterior wall vent-pipes are necessary, chases can be formed in the foam cores. Island or loop vents are also common practices and can be found in the plumbing codes. How are Greenix Panel buildings wired? Wiring a Greenix Panel building takes a little extra planning prior to construction. Greenix Panels are designed with a conduit chase and electrical boxes in the foam according to the structure’s plan and “blueprints.” Then, an electrician simply “fishes” the wire through the conduits to where the wire is needed. Wiring chases and boxes can be provided for electrical outlets and switches, wiring junctions, cable television outlets, telephone outlets, computer circuits, etc. Are Greenix Panel structures too airtight for good indoor health? No. Research indicates that the best way to provide a building (such as a home or office) with good indoor air quality requires two essential steps. 1.) The building has to be built as tightly as practical; it is easier to control air movements in a tight structure than in a leaky one. 2.) The building must have modern, upgraded mechanical ventilation features in the HVAC system so that it provides an appropriate and steady flow of fresh air. These modern HVAC features also contribute to cleaner air and better energy-efficiency. Are the high efficiency claims valid? Yes. Four key factors make the average Greenix Panel building very energy-efficient. 1.) Polyurethane foam provides higher insulating value per inch than traditional fiberglass or cellulose insulation. 2.) There is much less wood framing within the typical panel, which increases total R-value. 3.) The foam is continuous and is not susceptible to the commonplace flaws found in average batt installations. 4.) Foam, when bonded directly to the exterior and interior wall “skins,” doesn’t allow air infiltration around it. Greenix Panel System-made buildings are vastly more energy-efficient, stronger, quieter, and draft free than older building methods likes stud framing with fiberglass batt insulation. Fiberglass is sometimes used for furnace filters because air moves through so freely. Polyurethane foam consists of billions of tiny cells with solid polyurethane cellular walls. Air cannot flow from cell to cell or between cells. Rigid foam insulation is used as solid component insulation in almost every industry concerned about heat transfer, such as the refrigeration industry, for its inherent efficiency and prevention of air movement. These attributes are built right into the Greenix Panel System. Less air movement or leakage translates into far fewer drafts, fewer penetrations of noise, much lower energy bills, and a significantly more comfortable and controllable indoor environment. You can have a quieter, more comfortable home and office. Why are Greenix Panels stronger? Greenix Panels are a structural composite system acting like an I-beam. The skins act like the flanges and the rigid core is similar to the web. In short, the three components work together, rather than against one another. The composite assembly yields stiffness, strength, and predictable responses to loads. Greenix Panels have an integral tongue and groove system for joining panels together that also helps carry the structural load. A structure using the Greenix Panel System resist both compressive forces from above and buckling and warping forces from the sides. We test to the American Society of Testing and Materials (ASTM) E72-04 “Standard Test Methods of Conducting Strength Tests of Panels for Building Construction” for compression, transverse, and racking loads. Depending on the type of structural test being administered, Greenix Panels range between two and seven times stronger than traditional framing. Not only do test results show the panels are stronger, but real-life natural disasters have proven it. The great Hanshin (Kobe, Japan) and North Ridge earthquakes, Hurricane Andrew, a Colorado tornado, a Portland gas explosion, and an Omaha fire, have done more to prove structural insulated panels’s strength to homeowners, architects, and builders than all the scientific tests. What makes the Greenix Panel System superior to other building methods? Greenix Panels save time, money, and energy. They outperform other building methods in virtually every aspect because of the structural strength, ease of erection, and insulation value of the components. When someone says “R-value”, what they are talking about is resistance to heat flow in a given medium, such as fiberglass insulation. The higher the number, the greater the resistance to flow. Thus, a product with a value of R-25 is much better than a product with a value of R-13. In reality, this reasoning doesn’t take into account all the other components that go into making a wall: wood or steel studs every 16 or 24 inches reduce the overall R-value, and allow airflow within the wall space. In addition, other construction materials and components, such as bracing, nails or screws, wiring and switch boxes, and any number of things that are not insulation, and, in all likelihood, have low R-values, negatively affect the overall quality of an insulated wall, floor, or ceiling. Poor installation of fiberglass batt insulation can also reduce the R-effect significantly. A wall with fiberglass insulation rated at R-13 can have an actual result of R-10 or less due to these other factors. A new study by the Oak Ridge National Labs (ORNL) in Tennessee proves that a 4″ Structural Insulated Panel wall outperforms traditional 2″ x 4″ stick and batt construction, and even edges out 2″ x 6″ construction in terms of thermal performance. Structural Insulated Panels (if made with structural “skins” such as OSB) are structural elements. There are no studs or braces to cause breaks in the insulative action. The end result is a more comfortable, energy-efficient building that performs up to specifications in real-world conditions. Unlike stick and batt construction, which can be subjected to poorly installed – even missing – insulation; the nature of the Greenix Panel System is such that the structural and insulative elements are joined and bonded together as one. There are no hidden gaps. A solid layer of foam insulation is integral to panel construction. The ORNL study found that Structural Insulated Panels perform at approximately 97% of their stated R-value overall, losing only 3% to nail holes, seams, splines and the like. Wiring chases are preformed into the foam core, providing a continuous layer of insulation keeping the elements out and the interior free of drafts and cold spots. Greenix Panels are superior to traditional, old-fashioned methods of building construction.